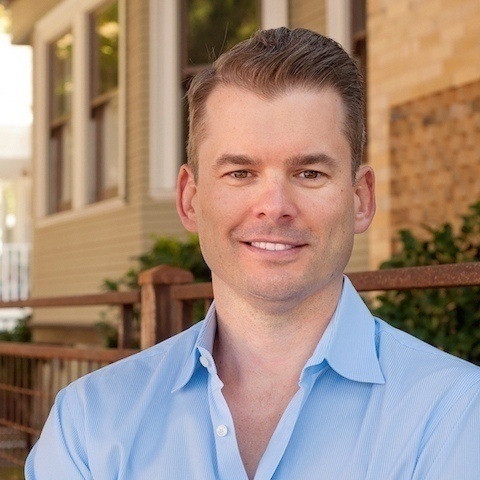 This is a Guest Post from David Jackson, CEO of FullStack Labs. Building apps and running a technology consultancy is a process-driven endeavor. Certain practices and procedures are performed on each and every project, and should be done the same way every time, by everyone on the team. But documenting and sharing these procedures can be difficult, and developers always seem to have different ways of doing things. When Fullstack Labs was just starting out, our team consisted of just two or three people, so it was easy to communicate and track things verbally. But as we grew, it became clear that we needed a more formal way of documenting and sharing our collective knowledge. So we tried using Word docs… but those quickly became unruly, growing to dozens of pages, making it difficult to access existing information, and share new information with the team. We knew there must be a better way, so we started asking around and heard about Guru. After a brief trial, it was clear that Guru had been built to solve the exact problems we were encountering, so we rolled it out to the team, and began using it in the following ways. We’ve found Guru to be particularly helpful for checklists. For instance, the front-end development card above stores the checklist our developers are required to follow, prior to sending front-end development work to their project manager for review. Front-end development requires a lot of attention to detail, and it’s easy to accidentally skip crucial steps, like browser and device testing, retina screen testing, etc. But with Guru, we’ve been able to reduce mistakes and wasted time. When we do make a mistake, we add a step to the Guru card to make sure it doesn’t happen again. This type of constant updating of best practices helps the team as whole improve over time. Hiring new team members, while necessary, can sometimes be a pain. Training on processes and best practices can be a serious barrier to bringing a new person on board. So, we’ve made Guru part of our onboarding process. Whenever we have a new developer start, we ask them to read all of our Guru cards to familiarize themselves with our development best practices. 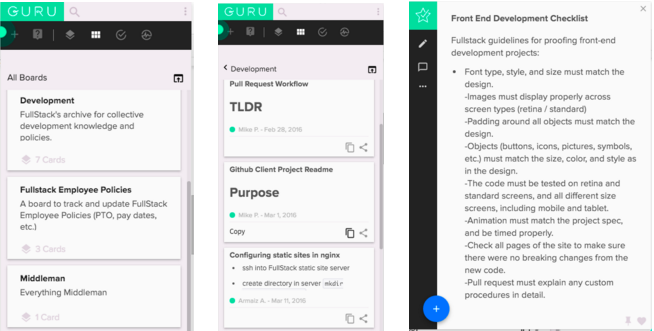 So instead of the new team member slowly getting up to speed over many weeks, and randomly asking dozens of questions, we instead ask them to spend a couple of hours in Guru. Once they understand our processes and workflows, they can more quickly integrate into the team and become productive. As our de facto HR manager, I field all manner of HR questions like: How much PTO do I accrue each month? When do we get paid? Am I covered for Chiropractic? Now each time I get an HR question I either refer folks to our Guru HR board, or I add the answer to the board if it doesn’t already exist. Our team can now easily search the HR Board and have their answer right away, without disturbing other members of the team. All in all, Guru has helped us improve efficiency and productivity, as well as the quality of our work. It allows us to better document and save institutional knowledge so it’s not lost if an employee or manager leaves our company. Our team members report improved morale because there is clarity around how they are expected to do things, and company policies are more visible and accessible. FullStack Labs specializes in building mobile and web applications, custom business software solutions, integrations, web and UX / UI design, and general technology consulting. Our code is built to the highest standards, using the latest technologies, and best practices. Our mission is to provide high-quality work at reasonable prices, and to constantly exceed our customers expectations.